While it may be hard to think that you can adversely impact a trail, even walkers can do damage during Mud Season. If you’re leaving behind tracks like the hiker above, you’re doing damage that can be very hard to repair. Picture this: It’s one of the first fine days of spring, the sun’s shining bright with a bluebird sky, the mercury’s touching 60, and you’re stuck sitting at your desk staring at the computer screen tap, tap, tapping away at the keys searching words that just don’t seem to come, all the while you’re staring at the clock as the seconds turn to minutes and minutes turn to hours – forever in a day while you’re champing at the bit to hit Highway 335 and get to Red Grade Trails and Scout’s Bluff to scout for the first Glacier Lilies and Pasque Flowers poking up out of the south-facing slopes that the sun’s shining bright upon because of that bluebird sky and the mercury touching 60. Finally, the clock strikes five and you’re blowing through Big Horn, tires squealing as you’re hugging the inside bend of the Brinton Museum turn and heading on up the hill to the parking lot at Base Trailhead. The birds are singing, the bees are buzzing, the aroma of Wyoming spring fills the air. But when you get there, the gate doesn’t say “Welcome to Wonderland,” it says, “Trail Closed Due to Muddy Conditions.” You let out a big sigh, say a few choice words to the sign that can’t answer back; deflated, you sulk back home and queue an old episode of Nitro on the WWE Network to salve your spirits. There are few feelings worse than not being able to enjoy exploring Red Grade Trails or The Classic Soldier Ridge Trail on a gorgeous spring day. Unfortunately, ‘tis the season for frustration as, after a long winter, Mud Season is finally here. And because of that, trails can get damaged quickly. That groove left behind by a bike tire is a channel for water, and can go from groove to gully to chasm to canyon in a single deluge. Sorenson said bike ruts aren’t the only challenge, so are holes from hikers’ shoes. Ruts and holes often cause users to veer off the trail, which causes even more harm. So, what should someone do when they want to hit the trail but don’t want the trail to turn into “anudder mudder?” Sorenson said users should turn around and not use a trail if any of these three things occur: 1) If mud is sticking to your shoes or tires. 2) If you’re on a bike and you’re leaving a long, snake-like trail behind you, or 3) If your shoes are punching deep holes in the trail. 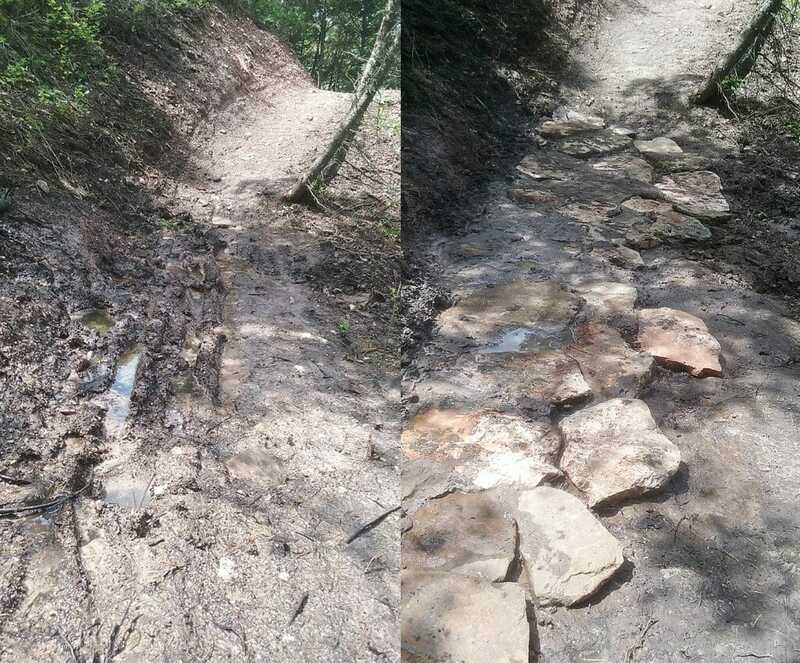 Trail damage during Mud Season can be a challenge to repair. 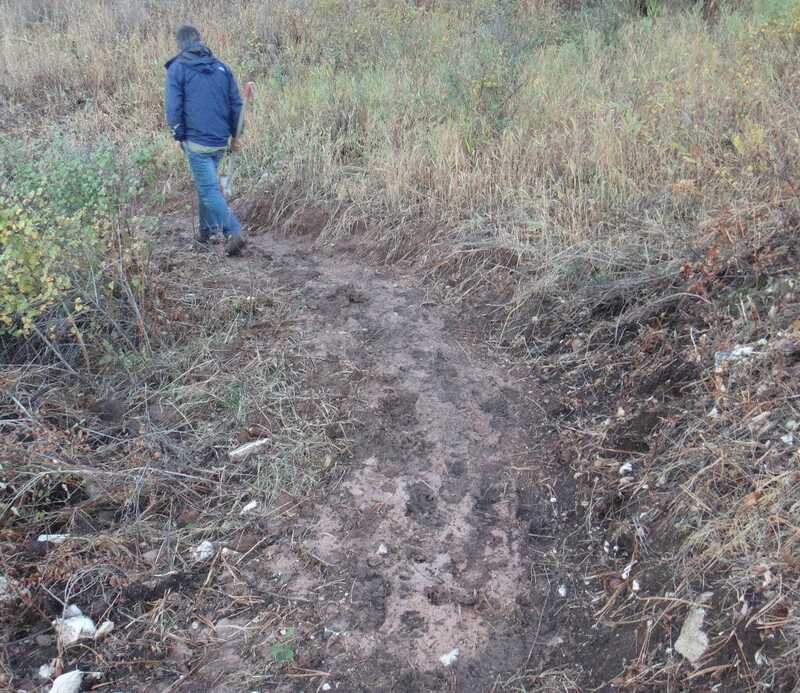 Even a relatively small area damaged while muddy resulted in a stone path being built to minimize subsequent damage at this spot on Red Grade Trails. It’s tremendously helpful volunteers who wind up spending those hours and days repairing those ruts and holes. It makes them angry when they spend their time fixing damage caused by careless trail users – and you won’t like encountering volunteers when they’re angry. Thanks to the marvels of modern technology, you needn’t worry about riling up a mob of volunteers wielding pitchforks, because Sheridan Community Land Trust has created a tool for you – it’s a Facebook group called “Sheridan Trail Conditions.” The goal? Know before you go. It’s something that’s working for trail systems across the country, so she thought it’d work well in Sheridan. Sorenson said she hopes folks will post pictures enjoying the trails; she’s also hopeful they’ll post pics of spots which need a little TLC. Sheridan Trails Conditions isn’t just for SCLT’s trails. People are encouraged to share what it’s like in Tongue Canyon, at Penrose and South Piney, up in the forest – even along the Sheridan Pathways. Except, now you can. But only if you join the “Sheridan Trail Conditions” group on Facebook. That way, the next time the sun is shining bright with a bluebird sky and the mercury’s touching 60, you won’t have to sulk home to another Nitro of WWE Network because you’ll know before you go!